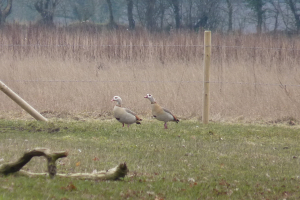 Observation - Egyptian geese in Norfolk - UK and Ireland. Description: This pair of extremely handsome geese were grazing in the field next door. I just happened to see them from the bedroom window. This pair of extremely handsome geese were grazing in the field next door. I just happened to see them from the bedroom window.